Unique-Desire: My first job a a "Makeup Artist"
Hey guys! I had a super busy Saturday! 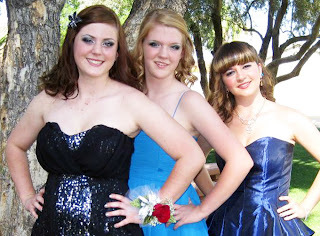 It was my school's Prom and I got a job doing prom makeup for a few girls! It was my first real job as a makeup artist and I had so much fun. I bought this cute suitcase to carry my makeup around in and I had all my products there with me. And I remembered to bring my camera so I could take pictures for you guys! This is my favorite look that I did out of the bunch, her name is Krystal! I think the most difficult part of it was applying the liquid liner and the false lashes, everything else was pretty easy. I charged the girls $25 each because they are only high schooler's(like me) and can't afford $40 for makeup at this point( I know I couldn't lol). You did such a beautiful job! This got me pumped for my job doing makeup for prom. I don't want payment though. Just starting to get some cred and self exposure. The makeup for all three girls looks stunning. But I kind of feel like the first girl's eye makeup is a little too... dramatic. I mean, her dress may have made it work, but alone I think it's just a but too much for prom, especially if there was a lot going on with her dress and/or hair. Again, it is beautiful, it just seems like it COULD have been two much. That said, I really love smokey silver eye! Wow, congratulations! :D Do you want to be a professional makeup artist? Wow! Love how Krystal's look turned out! You did a great job! Do you plan on doing professional makeup artistry as a job? You didn't miss much. Prom sucked! ;D I would much rather have gone to a concert or just have hung out with my friends. The first look is so bright and gorgeous! You did an amazing job of all of the girls. It looks like you did a FANTABULOUS job! I love Krystal's look and the other girls look great too. Uhm...the only thing I can think is to make sure you do a good long consultation before getting started. What don't they like? What do they like. Even if you love a particular finish of something they might not. That is what I am hoping for! Lovin' this look. Kinda reminds me of what I wore to my prom 5 years ago =X lol. Great girl! You're on your way to being a pro! !